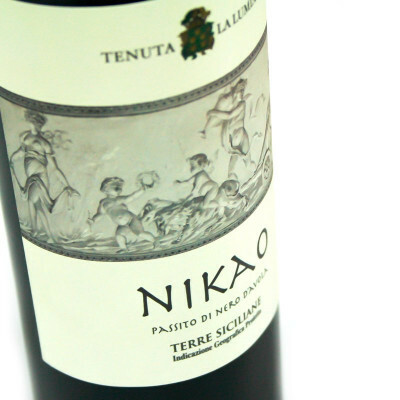 This Nero d'Avola Passito is the only one in the world of its kind: a real oenological masterpiece! A meditation wine, with features that make it a product of great pleasure! 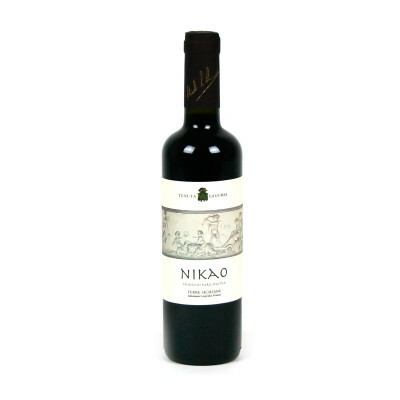 Nikao grapes are processed, harvested and vinified according to "Greek manual": field studies and ancient texts have allowed reconstructing what could be the oenological production method already used in the Greeks' time and bring it back to life. Obtained from a delicate drying of the best grapes of Nero d'Avola (the grapes are left to be killed for ten days in the plant and then again on gratings), the wine is then left to ferment for about three months in steel. It is full, enveloping, intense. A powerful but elegant nose, with net hints of marasca, dried figs, red fruits and spices. It is characterised by a perfect balance between hard parts and soft parts, between sweetness and tannins. Nero d'Avola Passito 100%. IT MAY CONTAIN SULPHITES. Abv 13-14%. Great with sweet and spicy, to drink alone and not necessarily at the end of the meal.